Montez Tate will be 16-years-old in June, he just got a summer job at Kroger. He may consider himself your typical teen. However, to his mom Carmen, he's anything but typical. "I didn't even think my son had that kind of power inside of him," Carmen said. It was a rainy Tuesday afternoon. Montez, his mom and his 1-year-old sister Destiny were on their way home in Madison so Montez could change for work. Carmen was behind the wheel, they never made it home that day. "The car hydroplaned and the only thing I saw was a pole," explained Carmen. Less than a mile from home, their vehicle went off the side of the road, flipped and landed at the bottom of a steep embankment. "He said mamma, we going to get out, we going to get out and I just passed out," said Carmen. "It felt like it wasn't real, but it was and it was happening," Montez said. Montez managed to get himself out of the vehicle and turned his attention to his baby sister. 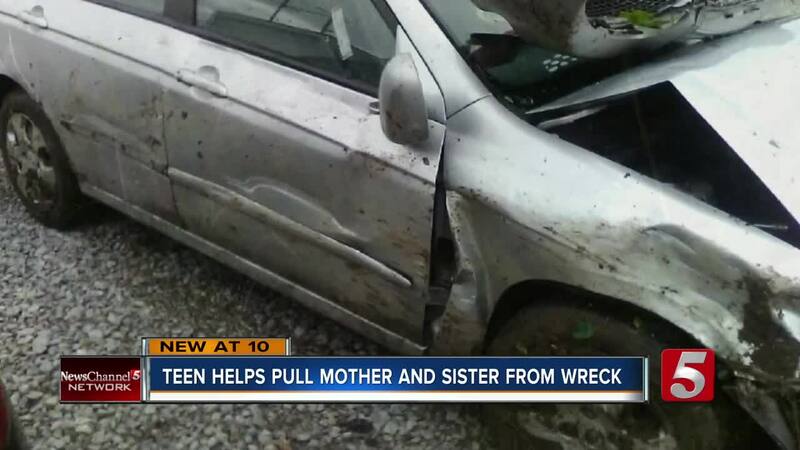 He pulled her car seat, with her in it, out of the car and began the trek up a muddy and slick embankment for help. "I set my sister down in the street and I ran into the middle of the street and I was waiving down somebody," Montez said. Thankfully, someone did stop and with Montez's help, they pulled Carmen out of the vehicle. "He had the strength of a beast," Carmen recalled. Montez lost his father to gun violence two years ago, he was not about to lose his mom too. "I didn't have a chance to save my dad," Montez said. "Of course, if I have the chance to save my mom, I took the chance." Carmen suffered a fractured jaw and a busted lip. Destiny has a large bump and bruise on her head but they'll be just fine. Montez walked away without a scratch on him and once he knew his family was ok, he continued his commute to work that same evening. "This is my first job so I wanted to prove myself that I can be a good worker," Montez said. A good worker, a good son, a great example for all young men. "You all have the power to conquer anything, just do good deeds," Carmen said. The Tates have no idea who stopped to help Montez, but they're sending out a huge thank you to that "guardian angel".